Well known for their dining tables, and unique extension tables, Cattelan’s Elan table is proof of the creativity for both aesthetically pleasing design and function. 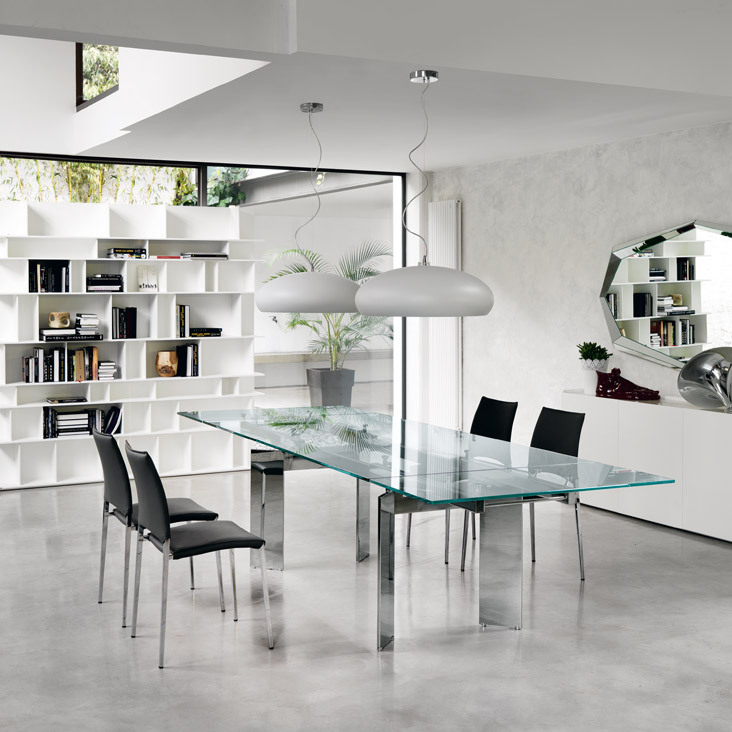 The Elan dining table features two side extensions and is available in four sizes. The legs of the table are produced in stainless steel or are covered in top grain genuine Italian thick leather in 29 colors, 2 shiny leathers, 4 crocodile and 2 snake stamped colors. The extension rails are available in silver, chrome, white or black painted steel, while the top and extensions can be finished in clear, frosted, mixed (frosted/clear), extra white or black tempered glass. The Elan dining table has an impressive modern design that will always provide practicality while never being ordinary. Cattelan’s “La Casa Completa” also includes occasional furniture, lighting, and bedroom furniture. They Dylan bed designed by Andrea Lucatello, is an example of perfect design engineering. The innovative structure gives the bed an illusion of the platform to be floating in air with its four legs that are positioned out of normal sight. It can be produced in 42 fabric options, 25 eco leathers and 26 soft leather colors. This bed exudes a distinctive character that echoes a modern scale and silhouette. Whatever you are looking for to complete your modern look, you can find it within Cattelan Italia’s extensive catalog of Italian designed modern furniture which is always being updated with new introductions and styles that continue to gain applause.